EarGels increases comfort with 3 sets of EarGels in different sizes. Choose the right size to ensure great sound quality in every circumstance. Customize your sound with the advanced equalizer, and make sure that you hear your music the way you want it to be heard. Need to add more bass when commuting? Quickly and easily boost the low frequencies for that extra kick. Modify your call settings so that they suit your preferences. Adjust how much of your own voice you want to experience on a call – making sure that what you hear sounds comfortable and natural. Adjust how much of the outside world you’d like to hear when using the headphones. It’s perfect if you want to be aware of what’s happening around you. With just one touch you have instant access to your voice assistant, direct to your headphones. Choose if you want to use Amazon Alexa, Siri®, or Google Assistant™. Easy access to core functions. 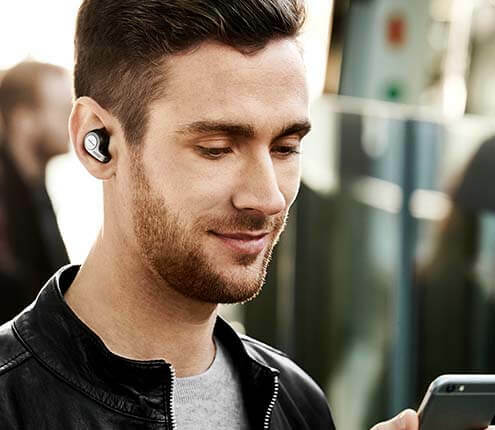 Conversations are made incredibly clear with true wireless earbuds that feature 4-microphone technology and are proven to deliver excellent call performance. The high-performance MEMs analog microphones provide a beam-forming directional field, letting in audio from only one direction – this lets your voice in, but doesn’t let in nearby voices. The 30-degree curved design of the microphone tip reduces wind-noise – with perforations optimized for acoustic performance and wind-flow around the microphone tip. Experience the stability that lets you take calls and listen to music without worrying about dropouts. The Main Printed Circuit Board (PCB) is the brain that links our Bluetooth chip and NFMI (Near Field Magnetic Induction) chip – the latter running a 10.5Mhz connection between the left and right earbuds. In addition, the Digital Signal Processing engine performs up to 80 million calculations per second based on a sophisticated algorithm that handles microphone input levels, equalizer while constantly adjusting to cancel out wind noise. The tiny coin cell lithium-ion battery produces 85-90mAh – delivering up to 5 hours of calls and music and up to 15 hours in total with the included pocket-friendly charging case. Using the rapid charging feature, you get 1.5 hours battery from only 15 min. charge. The earbuds’ casing houses the battery and 6mm speakers sealed for an IP55 rating protecting it from water and dust. The ergonomic design allows the casing to be smaller than previous generations and results in a super lightweight design (6.5g right earbud & 5.8g left earbud). This is the new best-in-class. These worked for me in a way that no other earbuds have. 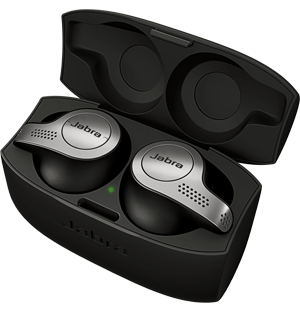 The real reason you'll want to buy the Jabra 65t is because they just work. [..] these earbuds fit very snugly in your ears. Can I hear music and make calls with just one earbud? Yes. If you put the left earbud back in the case you can use the right one solo. You cannot use the left earbud on its own. IP55 verified so protected from low pressure water jets from any direction. Can I buy a replacement earbud or charging case? Yes. You can order a new earbud or charging case from the Jabra Acessory page. How do I get accessories? You can order accessories and parts on the Jabra Acessory page. 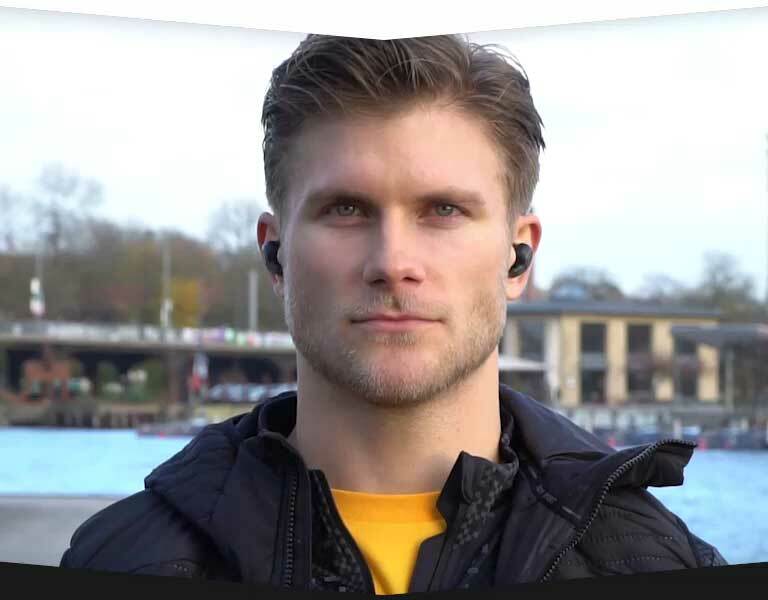 Jabra Elite 65t is optimized to be used with smartphones/mobile phones. It’s not specifically optimized to be used directly with a computer. You can check out the compatibility guide here. Great, but there is a trick to it. You should try all the different ear tips to make sure you have the right fit.